2 Hour Landscape Plant Flagging Consultation where we’ll create a plant list and flag the plant locations. Our 2 hour Landscape Plant Flagging Consultations are as close to an “instant” landscape design as you can get. They are best utilized for small planting situations in areas without existing plant material ( so we can place the flags correctly) where you need help in plant selection and placement. The first hour is typically taken up by a walk around of the area(s) you want to design and a sit down inside with our custom software plant database where we’ll pick a list of plants suitable for the space and your aesthetics. Then we’ll head outside where we will pick from our list, write the name of the plant on a vinyl wire flag, and stick the flag in the ground in the center of the new plant location. 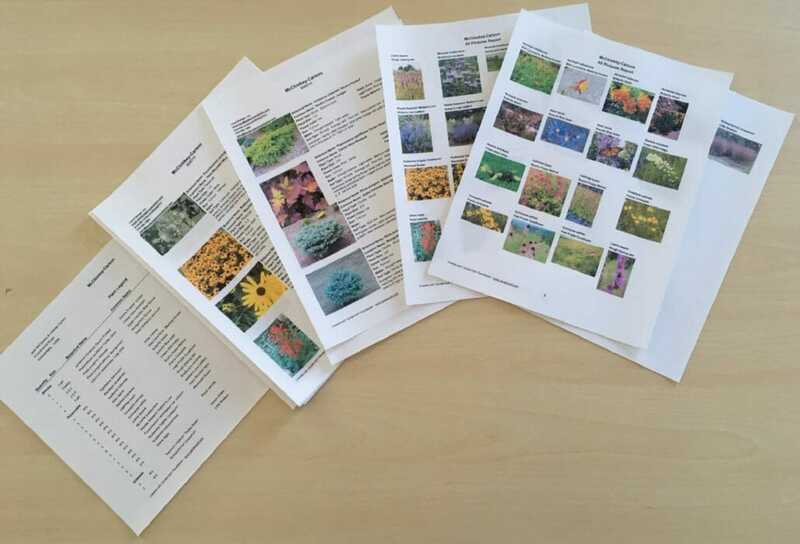 Your plant list will include all of the botantical info for all of the plants, photos and a concise list. We can download onto a thumb drive and away you go! Areas above a certain size, containing existing plants or complex hardscape elements cannot be addressed in a 2 hour consultation. These need to be planned with a Landscape Design Plan Package. 2 Hour consultations can also be arranged for initial brainstorming for larger projects or to seek answers to any problematic landscape situation. In that case be prepared to take notes to record the information and solutions we are discussing. For 2019 Our 2 Hour Landscape Plant Flagging Consultations are $195. Additional time can be added if our schedule permits for $80 per hour. An extensive plant list on thumb drive with a concise plant list, botanical info, and multiple photos of each plant. The list will typically have far more plants than flagged so you’ll have extra plants to try in your yard. 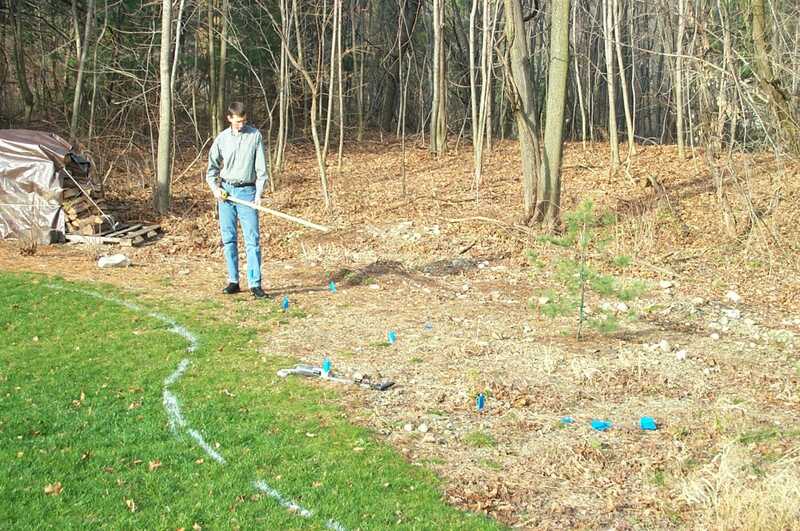 Exact placements for the new plants with wire flags marked with permanent marker to indicate the center of each plant. If the area is in lawn and requires a new bed, we’ll spray paint out the new bed line. An example of a plant list generated by our custom plant database compiled by John over the last 11 years. I Want to Schedule a Plant Flagging Consultation! Please fill out our landscape design questionnaire to start the process of scheduling an appointment.